How many times have you said, "There's got to be a better way to present my work on the iPad?" I have. Many times. So I finally got serious and searched for a simple, flexible presentation/portfolio app, and I've decided that Minimal Folio is the best for me. Why? Flexible - I can arrange images, PDFs, and videos in a sequential presentation, or as topic columns. When working in columns, I can follow one column down, but move sideways to related images. It's very simple to set up, but can be very impressive during the presentation. App Controls Via "Settings" - Once you get your presentation the way you want, you go to the Settings App for the iPad to lock it down. This allows you to hand your iPad to the client or viewer to let them enjoy the portfolio, but without worrying that they will accidentally alter it. Dropbox Syncing - You can upload images via iTunes to Minimal Folio, but I prefer Dropbox syncing. Point Minimal Folio to your Dropbox, and it creates a new folder in your Dropbox. Within that folder there is another titled "Minimal Folio." Your images have to go inside that nested folder. Once they are there, they are synced with the iPad. Very flexible. There are a handful of other useful features, such as copy and paste, import from your Photos app, display on an external output device, and share via email. Minimal Folio is only $2.99 in the App Store. 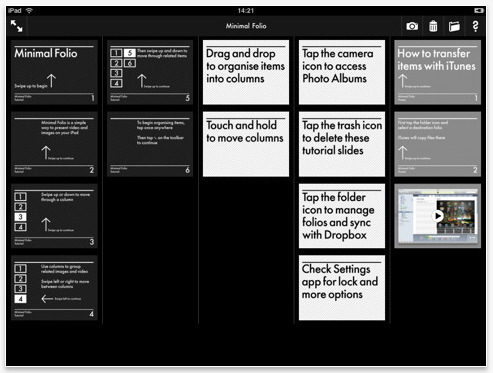 It's a terrific utility for photographers or anyone who wants to make presentations on their iPads. Thank you Derrick - this will be helpful. I'm the default "Mac guy" at work, but don't own an iPad yet. Some of our faculty do, though, and have been asking me for an app that does exactly this. Glad it helped. Actually, I originally came across it when doing some research for Lowepro. They'll be using it. But I've already incorporated it into my workflow. More on that stuff this coming Tuesday in the podcast. I was wondering if it is possible to have more than one category in the folio and viewing the folio w.r.t. these categories?